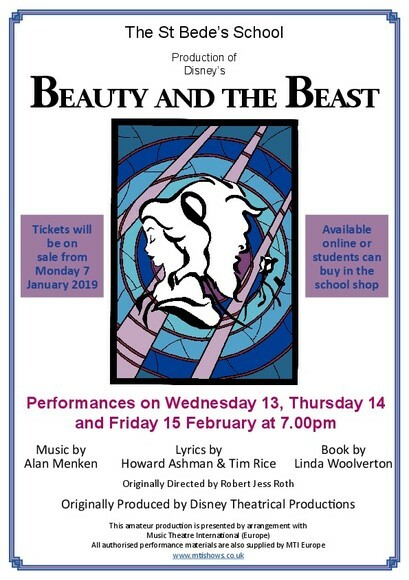 We are delighted with the response to the annual whole school musical production Beauty and the Beast. We only have a few tickets available for Wednesday 13 and Thursday 14 February and Friday is SOLD OUT. Students can purchase tickets from the school shop at break or lunchtime. Rehearsals are underway for the orchestra and actors. The St Bede's School show is always a great evening of entertainment for the whole family - children, parents, grandparents as well as friends have all appreciated our school shows. Thank you for supporting the school with this event. Please keep tickets safe and bring them along to the show for entry. Thank you.